A newly published government guidance document on charging infrastructure for electric vehicles (EVs) is expected to enhance the development of a safe and consistent charging network. With New Zealand’s EV fleet now surpassing 2500 and “exceeding all targets”, Transport Minister Simon Bridges says the aim is to provide clear recommendations for both investors and those enabling the development of charging station sites, such as local authorities. “While we expect most charging will continue to take place at home or the workplace, reliable public charging infrastructure is crucial to provide drivers with the confidence to make longer trips,” says the Minister. Minister Bridges adds that the New Zealand Transport Agency worked closely with local and central government and industry to identify recommendations that would best meet the long-term needs of EV drivers. Supporting the development and roll-out of public charging infrastructure, the guidance document forms part the Government/industry programme to achieve 64,000 EVs in New Zealand by the end of 2021. Formal notice has been given to major shipping lines that members of the National Road Carriers (NRC) will “not accept any charges for detention on empty containers” in Auckland. In a letter issued to carriers on Friday January 13, NRC chief executive David Aitken stated the shipping industry had created a situation in the city “where it is not possible to economically and safely return empty containers in a timely manner”. “Our members are not able return containers and will be forced to leave them at client’s premises or store them elsewhere,” he stated. “They will recover these costs from their clients, who may in turn seek recompense from your companies. Subsequently, NRC port committee chairperson Chris Carr stated that empty container depots were “full to the brim and then more”. “Shipping lines have known about this building issue and have in fact allowed it to happen,” he added. A failure of pending alliances to return the global container shipping industry to profitability could deliver a devastating future reality to the interests of shippers, according to former Hyundai Merchant Marine vice-president David Arsenault. In a recent address to the International Propeller Club, Mr Arsenault reportedly stated that if those new alliances cannot sufficiently raise rates, then shippers “won’t like the next step”. That next step would entail rapid consolidation through mergers and acquisitions that would leave the industry with a handful of extremely powerful shipping lines that could set freight rates at will, reports JOC.com. Mr Arsenault said such a scenario had occurred in the global airline industry, where after many bankruptcies and mergers, the remaining carriers were now in a position to influence capacity so as to keep planes full and fares on a continual rise. Meanwhile, JOC.com is also forecasting that United States ports will face “unprecedented” operational challenges when containerlines restructure from four down to the three new global vessel-sharing arrangements on April 1. It predicts that the introduction of The Ocean Alliance, THE Alliance and the 2M Alliance will particularly result in “magnified” challenges for the ports of Long Beach and Los Angeles. Previous congestion issues at such ports has caused significant flow on “out of window” call impacts for New Zealand and other ports around the world. Marketplace rumours are circulating that one of the world’s largest containerlines could be eyeing a potential takeover bid for Hong Kong-based Orient Overseas Container Line (OOCL). Currently ranked eighth in the world in regards to capacity at 571,183 TEU according to Alphaliner, the carrier’s shares have been observed to undergo a significant recent surge on the Hong Kong stock market amidst the speculation. It has been noted that the gap is “widening” between the largest carriers — AP Moller-Maersk at 3.28 million TEU, Mediterranean Shipping Company at 2.84 million TEU, CMA CGM at 2.13 million TEU and COSCo at 1.64 million TEU — and the rest of the marketplace. Furthermore, Transport Intelligence observes carriers such as OOCL — which is actually slightly smaller than the about-to-be acquired Hamburg Süd — are becoming increasingly “vulnerable” as the larger carriers continue to grow through acquisition. “Such consolidation cannot be anything other than a challenge for the likes of OOCL,” it states. “Although it has a better record of profitability than many others, for the first half of 2016 the company experienced a loss, mitigated by the revaluation of assets. Pricing becoming “shakier”, further consolidation and alliance adjustments are among predictions for the global container shipping industry made by the JOC.com media outlet, following what it describes as “one of the wildest years in container shipping history”. “Within one year, the industry witnessed the largest bankruptcy in liner history with Hanjin Shipping, historically low spot rates, the narrowing of the top 20 global container lines to 14 and the dramatic reorganisation of global shipping lines into new, larger vessel-sharing agreements,” it states. The Newark (United States)-based media outlet is also predicting a squaring off between labour and employers in American ports and big ships testing that country’s port infrastructure, as well as terminals and ports banding together on the global scene. On the latter point, JOC.com comments that having observed the operational and cost efficiencies containerlines are generating by teaming up with rivals, ports and terminals around the world have begun to follow suit. “The ports of Seattle and Tacoma joined forces in 2015 to improve productivity and eliminate excess capacity, and the end of 2016 saw a flurry of activity among ports and container terminals seeking to form co-operation agreements. 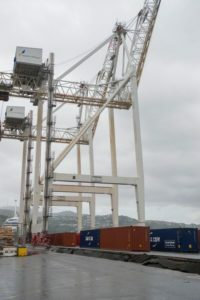 Modified container operations are expected to recommence at CentrePort Wellington by July this year or sooner. CentrePort chief executive Derek Nind this week announced work is planned to secure its two 86-metre-high and 720-tonne gantry cranes, which were rendered inoperable among the significant damage suffered by the port in the November 14 earthquake. While CentrePort is to continue working with shipping lines over using geared ships as an interim solution, the port is progressing a plan to both reintroduce crane operations and build resilience in case of another significant event, says Mr Nind. “This would immediately improve CentrePort’s capacity and productivity, allowing us to serve the needs of importers and exporters in the central region. We will be keeping our customers informed as these plans develop. “We know how important container shipping is to the regional economy. That’s why we worked hard to quickly restore limited container movements using ships with their own cranes. We are now assessing longer-term options to keep freight costs low for Wellington’s businesses.